HELSINKI, Finland — China launched an Earth observation satellite July 30, seeing the country equal its record for launches in a calendar year with 22. A three-stage Long March 4B lifted off from the Taiyuan Satellite Launch Center in northern China at 11:00 p.m. Eastern Monday, carrying the Gaofen-11 satellite into a Sun-synchronous orbit. The China Aerospace Science and Technology Corporation (CASC), the main contractor for the space program, confirmed both the launch and its success just over half an hour after liftoff. Gaofen-11, a sub-meter resolution optical satellite, will become part of the China High-resolution Earth Observation System (CHEOS), initiated in 2010 to provide all-weather, all-day coverage by 2020 with optical and synthetic aperture radar satellites, and could also include airborne and near-space systems such as stratospheric balloons. Gaofen-11 was developed by the China Academy of Space Technology (CAST), a spacecraft and satellite maker under CASC, but few details on its capabilities have been released. Chinese state media report that the Gaofen-11 satellite will be used for land surveys, urban planning, road network design, agriculture, and disaster relief, while its data will also be used for the country’s Belt and Road international trade and infrastructure initiative. The satellite is the sixth in the Gaofen series launched this year, following a triplet of Gaofen-1 satellites, and the larger Gaofen-5 and -6, all placed in Sun-synchronous orbits. The series, which means “high resolution” in Chinese, also includes one geosynchronous satellite, Gaofen-4, launched in 2015. Gaofen-7 could also be launched to SSO before the end of the year. The Gaofen-11 launch was the 63rd launch worldwide in 2018 and also sees China draw level with its record of 22 launches, set in 2016, which included one failure and another partial failure. The failure in August 2016 prevented the Gaofen-10 satellite from reaching orbit due to an issue with the third stage of the Long March 4C rocket. 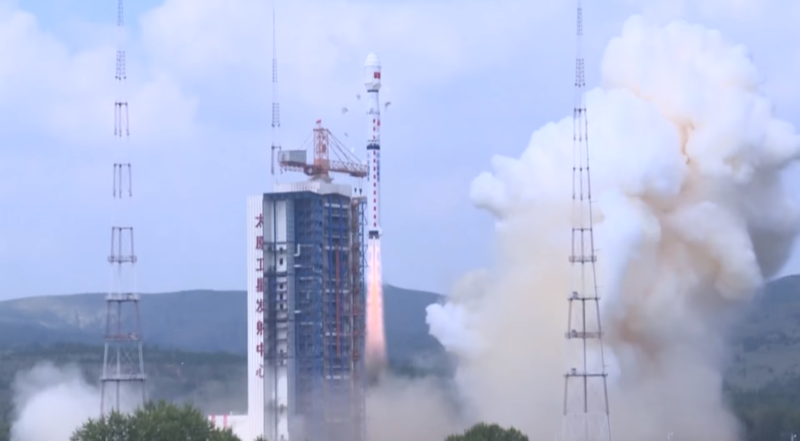 The launch followed a weekend mission which saw two Beidou satellites successfully sent into medium Earth orbits as part of the Beidou global navigation and positioning system, a Chinese answer to the GPS, GLONASS and Galileo systems developed by the U.S., Russia and Europe respectively. The Long March 3B with a Yuanzheng-1Z upper stage lifted off from Xichang in the southwest of the country at 9:48 p.m. Eastern on Saturday, July 28, sending the satellites directly into 55-degree inclined medium Earth orbits at around 22,000 kilometers altitude. The satellites — the eighth and ninth Beidou system satellites launched in 2018 — are the 33rd and 34th overall. The first Beidou satellite was sent into orbit in 2000. Further Beidou launches are expected from Xichang in the coming months as China seeks to complete the system of 35 active satellites by 2020. Along with civilian uses such as navigation and positioning, Beidou will also provide weapons targeting, guidance and other services for the People’s Liberation Army. CASC is aiming to launch around 35 times in 2018 and appears on course to get close to this number with five months to go, having succeeded with all 22 of its missions so far. China’s 2018 launch manifest is partly made up of missions delayed by a near three-month cessation of launch activities last year, following the failure of the second Long March 5 heavy lift rocket. An issue with the first stage engines meant the launch vehicle failed to reach orbit on July 2, 2017, prompting an investigation and engine redesign. The return-to-flight of the Long March 5 was scheduled for late this year, but that may now slip into 2019. Dependent on the success of the launch are two major 2019 missions: the Chang’e-5 lunar sample return on the fourth Long March 5 and the test flight of the Long March 5B variant, which is designed for lofting the 20-metric-ton modules of the planned Chinese Space Station into low Earth orbit. Late 2018 will see the Long March 3B launch of the Chang’e-4 lunar mission which will attempt the first-ever soft-landing on the far side of the Moon which, due to tidal locking, never faces the Earth. A relay satellite named Queqiao was launched to the second Earth-Moon Lagrange point beyond the Moon in May and will facilitate communications between the Chang’e-4 lunar lander, rover and ground stations on Earth. Additionally, private rocket companies Onespace and Landspace, two startups which have emerged since a Chinese policy shift in 2014, will also aim to perform their first orbital launches in late 2018. Expace, a nominally private launch provider tied to China Aerospace Science and Industry Corporation, the state-owned missile maker and defense giant, is also expected to launch a number of commercial satellites this year using its Kuaizhou solid propellant rockets.